Economy | "Not About Quality"
Lies, damned lies, and statistics. Recently, I’ve been getting a graduate-level course in how to lie with numbers. The first lesson comes from the Heritage Foundation, which has a chart showing that despite spending tons of money on anti-poverty programs, the poverty rate hasn’t budged in years. 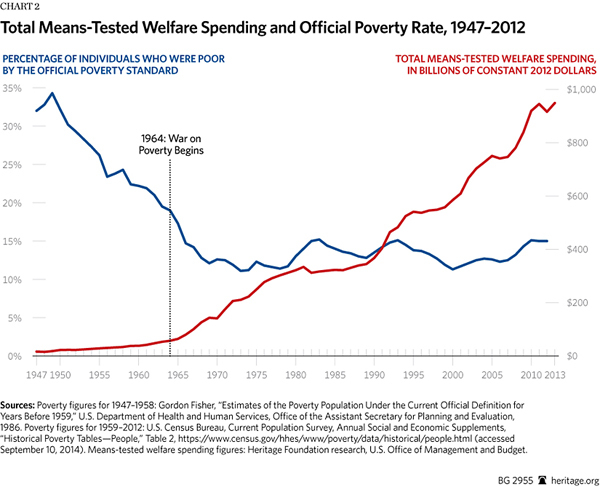 The chart is by Robert Rector, in a column titled “The War on Poverty Has Been a Colossal Flop.” What’s wrong with this picture? The vast majority of means-tested welfare programs, like Medicaid, are not counted by the official poverty standard. So basically, the chart proves that anti-poverty programs don’t reduce poverty when you ignore the effects of anti-poverty programs. Strangely, Rector acknowledges this point, which makes it even weirder that he would go through the trouble to make the chart in the first place. His argument seems to be that poor people aren’t really poor because they have microwaves (seriously). So…if there are no poor people, then didn’t we win the War on Poverty? Rector still says no, because the poor don’t all have good paying jobs. I agree that’s a problem, I’m just not sure taking away their health insurance will solve it. This entry was posted in Economy and tagged American Enterprise Institute, Corporations, Heritage Foundation, inequality, MSNBC, Poverty, Profits, statistics on September 17, 2014 by Harry Stein. Congress Just Passed a Trillion Dollar Spending Bill. What Does It Mean for the Economy? The omnibus reverses some of the most damaging sequester cuts, but not all of them. The omnibus also makes a few excellent investments in our economy, and it is certainly better than allowing the full sequester cuts to continue for another year. This column focuses on four major areas of economic investment: infrastructure, early childhood education, scientific research, and job training. It also examines the smaller but very important long-term investment in preventing lead poisoning. Altogether, the omnibus delivers mixed results for these sectors, primarily because it faces restrictions from a spending cap that is simply too low to enable the investment our economy needs. The whole column is posted here. This entry was posted in Budget, Economy and tagged Appropriations, Congress, Head Start, Infrastructure, Lead poisoning, Omnibus, Science, Spending on January 17, 2014 by Harry Stein.